Let's cut to the chase. The LG 55EC9300 is the best looking TV that I have ever reviewed. 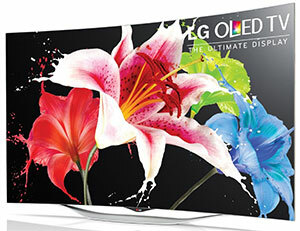 Despite its hefty price tag, this LG 55EC9300 55-inch OLED HDTV wholeheartedly earns our Highly Recommended rating. With that said, despite its delectable display, this LG TV is still not my ideal - though currently its vying for the top spot. First, though curved screens appeal to my design aesthetic, I'm not convinced that curved improves the viewing experience, especially if you have to pay a premium over a flat screen. Ideally, OLED TVs would cost less, but producing these next-gen panels this size are still expensive. The 55EC9300 is a 1080p display. For a hedge for the future, I would prefer a 4K Ultra HD model. And indeed, LG does offer 4K OLED TVs. But speaking of budget considerations, 2014's LG 65EC9700 65-inch Ultra HD OLED TV is on sale for a cool $10,000. The prices for the 2015 versions rolling out soon will be much less stratospheric. And at least one model will not be curved. With those factors in mind, videophiles who have been salivating over the emergence of a big screen OLED TV will be delighted in the performance of the LG 55EC9300. The performance of this OLED display in the LG 55EC9300 is unsurpassed in the current world of 1080p TVs. Its deep blacks provide an ideal foundation for its rich colors. The integrated audio definitely plays second fiddle to the picture, which deserves the support of a full orchestra in terms of a dedicated multi-channel surround system. All of the basic Smart TV features are provided including built-in Wi-Fi and a host of streaming content providers. In addition, 3D playback and voice recognition are incorporated, But there is no integrated video camera, which means no Skype or motion control. LG's webOS interface is easy to navigate with the Magic Remote. Of course, any Smart TV will take a little time and study if you want to tap all of its possibilities. It's against my parsimonious nature to label a 55-inch 1080p TV costing around 3 grand a "real value." But for videophiles who have been waiting for OLED picture quality, the LG 55EC9300 looks like a bargain. And at the time of writing this review, LG has put this TV on sale for $500 off its MSRP, which makes it even more tempting. I also believe OLED is the best panel, but I am not so convinced on the curve, from displaying this in the store and having customers sit in front of it, it because is a curve does gather more light and reflexes it back at the viewer at eye level, so in trying to sell this we have to discuss that they may need to close shades during the day if in a room with plenty of windows.